PerfPRO Studio© is a fully stand-alone training and performance analysis application that supports up to bike trainers, indoor bikes, treadmills and rowers as you need. PerfPRO Studio is capable of handling single home use to very large group settings with just about any type of Windows machine. You may also mix up the trainer types, bikes, and treadmills to allow a high level of flexability in your studio. PerfPRO Studio for Individual Riders. For individual riders, PerfPRO Studio is the perfect at-home training solution. 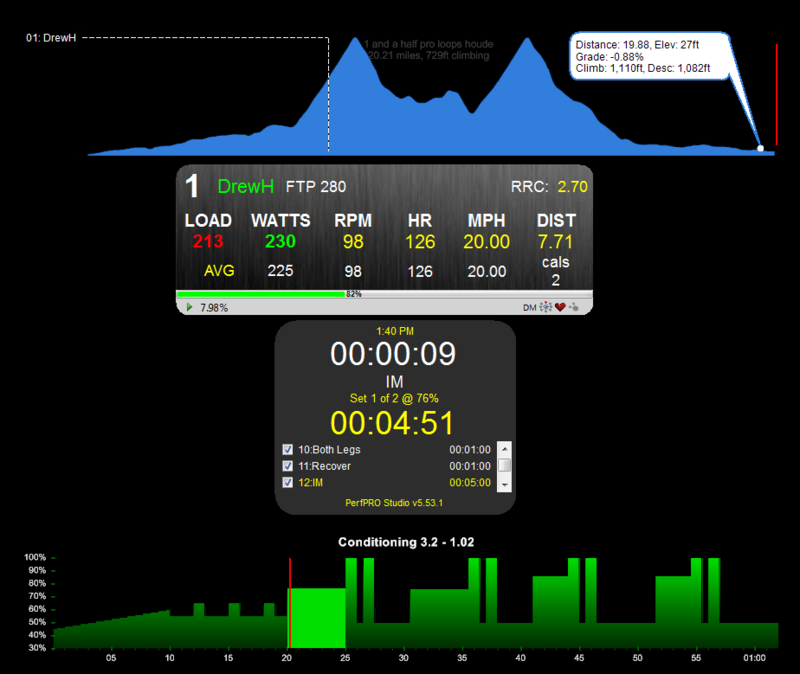 Whether you are into FTP% and ERG workouts, video workouts, course riding or all of the above PerfPRO has you covered. And when your workout is complete let Analyzer push workouts up to your favorite website, automatically email your reports, and do extremely detailed analysis within. It has a metric ton of functionality shoved into one very affordable package. You don't need to own or use one of the supported electronic trainers to take advantage of PerfPRO Studio. PerfPRO Studio comes with support for multiple stationary trainers as well. Because PerfPRO Studio is fully ANT+ enabled you may use your various wireless devices with your turbo trainers or any other supported trainer type. You can even get simulated power (SimPower) wattage readings if your trainer has one of the supported power curves within PerfPRO Studio. All you need is an ANT+ enabled speed sensor and suddenly power just got cheap! PerfPRO Studio also allows for single or group treadmill use. With the use of an ANT+ foot pod you may view speed/cadence stats (and anything else) while running on your treadmill. For structured workouts like FTP% workouts, PerfPRO instructs runners what speed they set the treadmill at based on a percentage of their threshold PACE. Unique treadmill data displays are available to each runner. It ends up being a very interactive/structured workout that tends to cause time to fly by no matter the distance. PerfPRO Analyzer is included with PerfPRO Studio. These two applications are full integrated with each other so performance data is quickly loaded after workouts and detailed analysis can be done immediately. 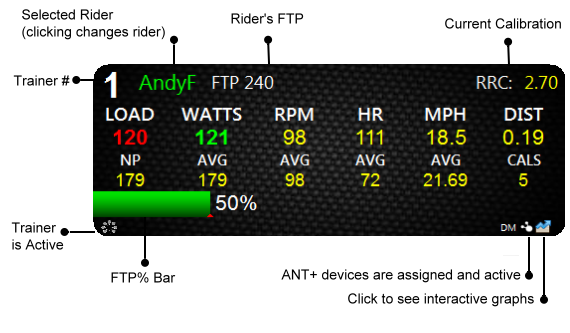 There are also options to automatically upload performance data to *TrainingPeaks.com and/or the PerfPRO website as well as auto-generate emails with links to reports after each ride. From a studio administrator standpoint, this is a huge time-saver! Checkout PerfPRO Studio's Feature Sheet to see all it has to offer. You'll love its workout/course features and ANT+ enabled capabilities. Below is a typical single rider display explaining each piece of data. For a 10-trainer studio your screen would show ten of these individual displays. Each athlete would then use their own handlebar controller to change screens to see additional data and use their menu options to control their own ride.